After some time in Baltimore and Annapolis, we explored some serene anchorages and the lovely little town of St. Michaels. 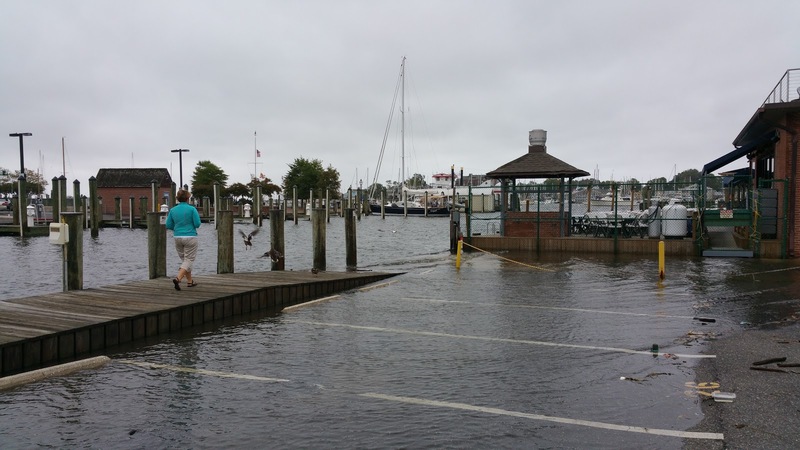 We hunkered down in Solomons, Maryland while Hurricane Matthew passed far offshore. 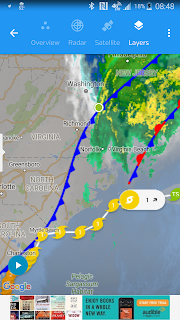 Now, after a couple of long legs we're in Hampton, Virginia awaiting a weather window to jump off to Bermuda! 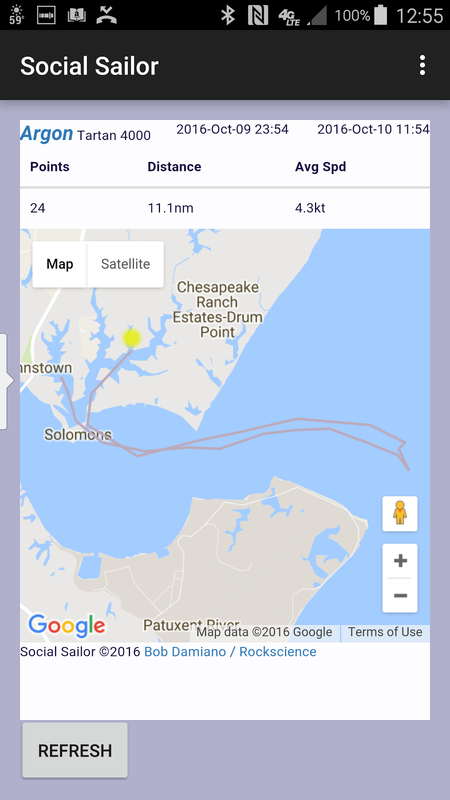 Annapolis - Drinking Town with a Sailing Problem[tm]. 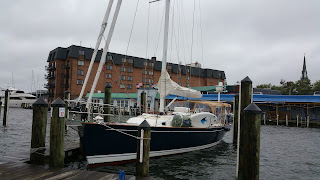 We spent a few days in Annapolis on the public dock right downtown. 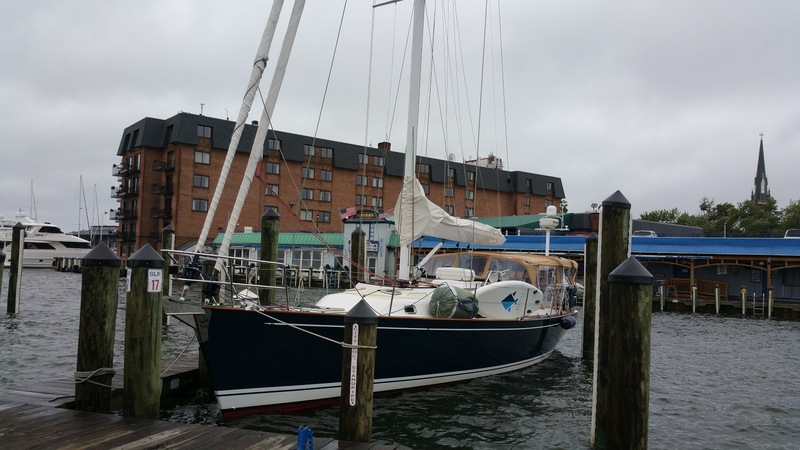 This was about a week before they would begin staging boats for the immensely popular Annapolis Sailboat Show. We had a bit of weather while we were there with some sustained wind in the 20s and gusts to 30 and absolute torrential rain at times. We pulled bow-in to these little finger piers between pylons because otherwise, we would have had all that blasting into the cockpit. The harbormaster had offered us a chance to move further in and tie up against the sea wall. We had such a complicated tie-up on the pylons that we didn't want to bother undoing all that to move. That ended up being a bad decision. The next day, we were blown so hard off of the fixed finger pier, that we could not get off the boat for most of the day. Tide was well above normal high tide all day. 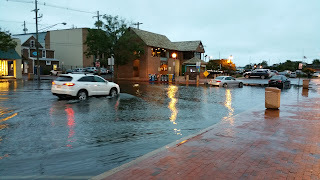 The downtown parking lots were flooded. It was nasty. But Annapolis is awesome. We went on several long walks exploring and even hiked the 2 miles to the grocery store and back. There are endless restaurants and bars in Annapolis. 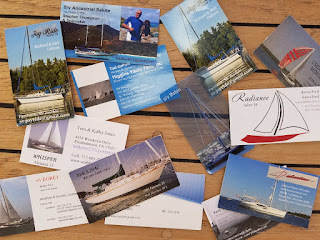 There are thousands of sailboats in marinas all around the city. Two or three power boats too. 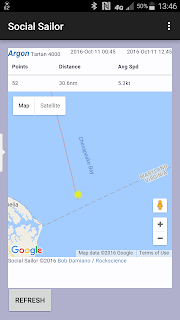 After things calmed down a bit, we took a mooring ball from the harbormaster over in Back Creek. What an amazing place! Marina after marina after marina absolutely packed with sailboats. 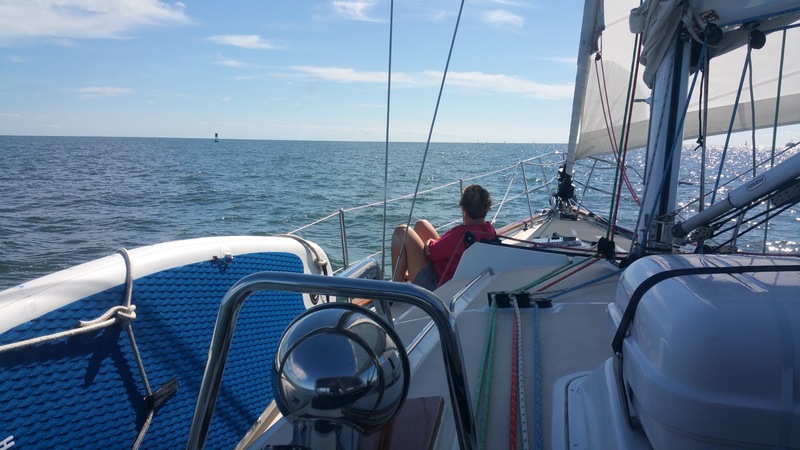 After Annapolis, we were looking forward to a free night or two at anchor. Linda found a great spot up in one of the nooks off the Wye River on the Eastern Shore. This is birder's heaven. Herons and Eagles all over the place. Quiet, peaceful and beautiful. 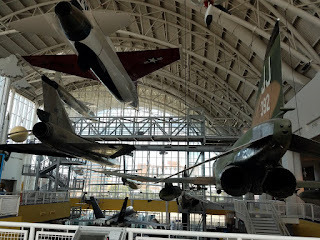 The only slight issue is that we had very little connectivity over there and I really needed to get some work done. 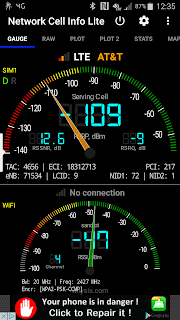 Always monitoring the 4G signal strength (or lack thereof). 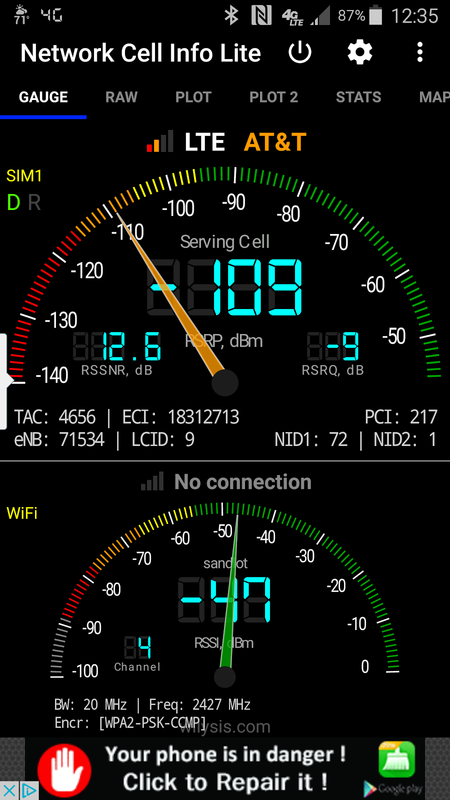 Here we just barely have a weak LTE (4g) signal. For that reason alone, we decided to get back to civilization and St. Michael's, MD was not only on everyone's list of suggested destinations, it was also very close by. A few episodes ago, I was ranting about the cheesy switches that Quick used for windlass switches. I replaced them with some more robust ones I found on Amazon. Well... one of those failed too! While in Baltimore, we went to the West Marine and I got some really heavy duty blue sea brand switches ($30/ea). These had a narrower shaft so once again, we had to fill the holes with epoxy and re-drill them. While I was at it, I also over-drilled all the mounting holes for the covers and filled them with epoxy too. New switch mounted in fresh new hard epoxy. Mounting holes ready to be drilled into new epoxy as well. New switches mounted and wired up. So far, so good. Again, the switch failure mode was stuck ON. This time the UP button stuck. So, we are very much now in the habit of turning off the windlass breaker when not in use - especially while the anchor is down. 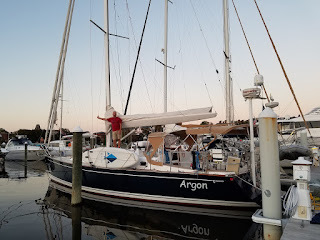 We did manage to keep to our goal of "free anchorage" in St. Michaels. There is room for a handful of boats just off the north and south sides of the main channel. This is not a very protected anchorage from east wind (and that's what we had), but it was just fine. It was here that we started to really worry about Hurricane Mathew. At that time, the projected track was not looking good for the Chesapeake Bay. We talked to the very nice folks at Higgins Yacht Yard and they told us that they were planning on hauling all of their customers and they could probably haul us too, or put us in the Travel Lift Dock. We decided to leave the final decision until the next morning. 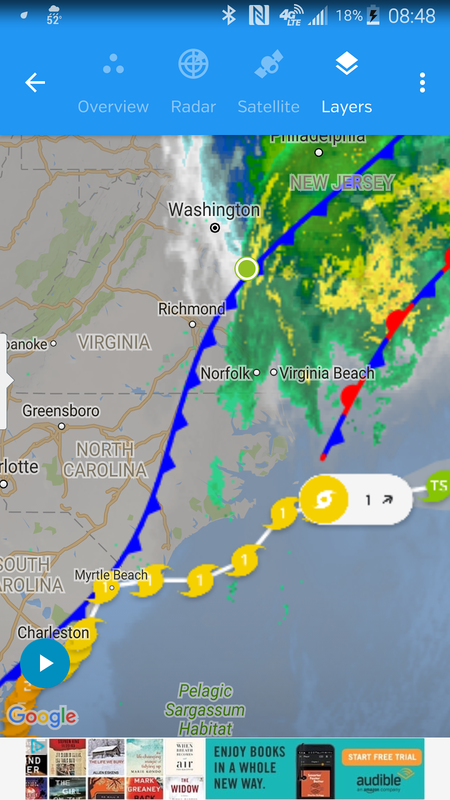 The next morning, Mathew's projected track began to curve it around to the east (offshore) before it got as far north as us so we were a little less worried. As the day went on, the track looked better and better for the Chesapeake. We told the folks at Higgins that we for sure did not want to be hauled and in fact by that time, they had decided not to haul anyone anyway. Hurricane Mathew's projected track heading offshore and curling around south. We were relieved to see this. 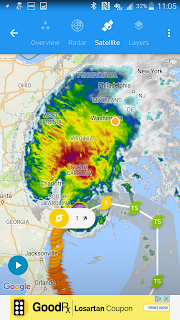 We are at the yellow dot upper right section of the storm. 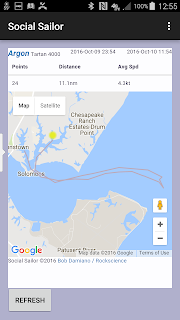 Since we had a couple days before whatever Mathew would bring, we decided to make some southerly progress (you know, closer to the hurricane) and make it to Solomons Island (still in Maryland) off the Patuxent River. 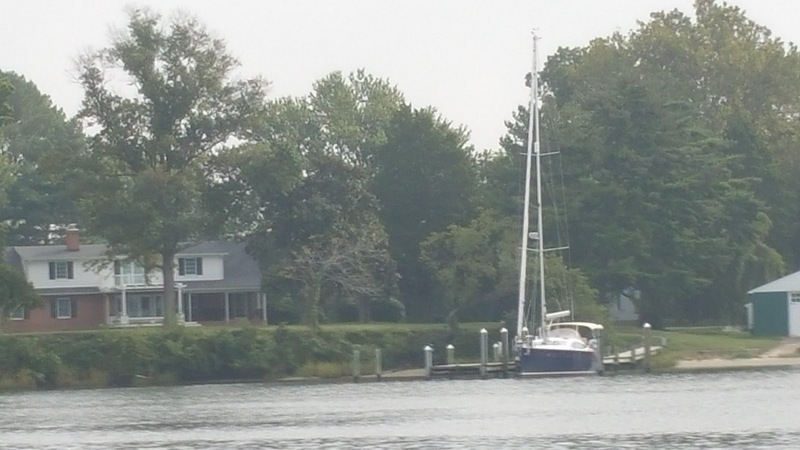 Zanhiser's Yacht Center in Solomons, MD is a great facility. We anchored just outside of their mooring field and went ashore. The dinghy dock welcomes anchoring guests but they do ask for a $3 landing fee. 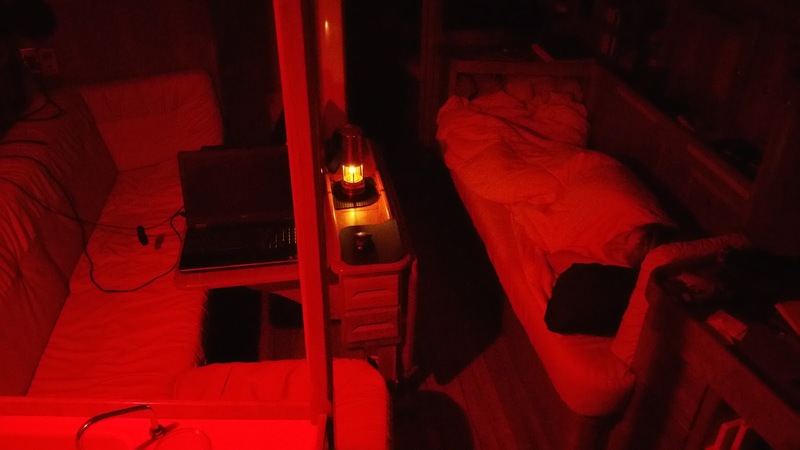 We went to the office and they managed to up-sell us to a $40 mooring. This gave us access to very nice showers, laundry, free bikes, and a courtesy shuttle for grocery shopping. Great deal! It also allowed us to be on a mooring when the outer winds of Mathew hit us the following night. I asked the dockmaster about the ground tackle on these moorings and he said they were 500 pound mushrooms with 3/4" chain. Sounded good. I didn't ask when they were last inspected. Maybe I didn't want to know. The effects of Mathew were going to be felt over most of the weekend. Saturday Night was forecast to have the highest winds slowly tapering off through Monday Morning. We decided to do watches overnight Saturday and keep an eye on things, so we both set our alarms. This was unnecessary as neither of us could sleep a wink anyway. Adding to the insomnia a bit, Mathew had stopped following his clear instructions and started heading more North and less East. I was beginning to wonder if leaving St Michaels was really so smart. Overnight Saturday, winds were sustained in the 20s with gusts well into the 30s. You try not to think about the integrity of the mooring, but you do anyway. It was very noisy inside the boat with wind howling and that mooring line straining while stretched like a guitar string. I had tied an additional mooring line with a blake hitch to the main mooring line to make something of a bridle. I went up on deck a couple times overnight and we were dragging the mooring ball completely under water. We were very happy to see daylight the next day. The wind was still blowing hard, but it always feels less scary when the sun is shining! 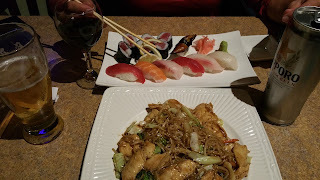 Date night going to the restaurant Saturday Night - we were in for a long night that night. Lets' Go! Nope - too soon! 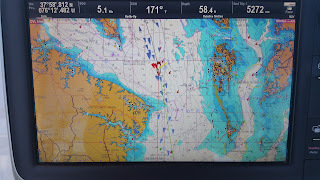 On Monday, we decided to head out into the bay and make our way more south toward Virginia. 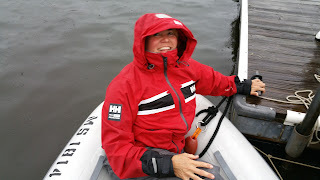 We motored out into the Patuxent and the winds and waves built. 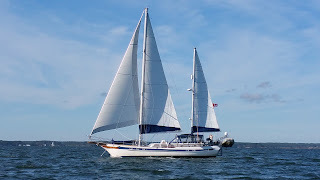 We started sailing with a reefed main and jib and the closer we got to the open bay, the heavier things got. 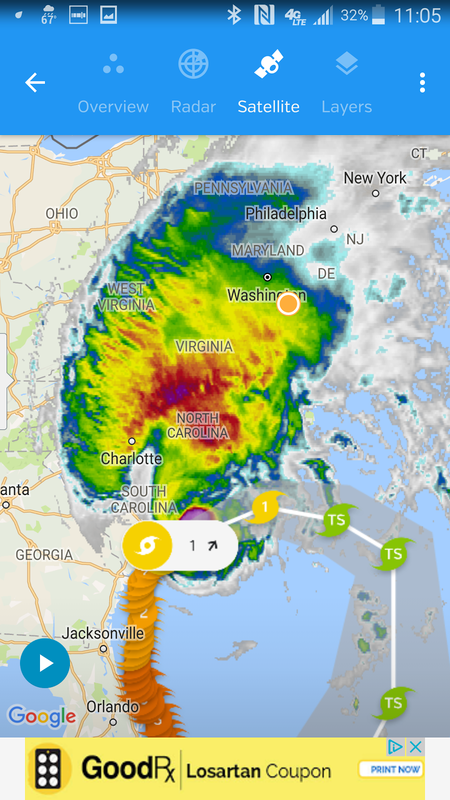 We poked out into the bay a little bit and things were just nasty. Remnants of the impact of Matthew were still very strong and would make for an uncomfortable and adventurous sail. 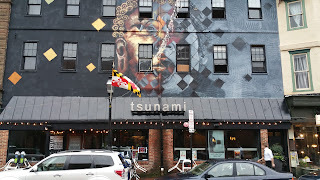 So - we turned around and beat our way back into the Patuxent and some relative shelter. Our track for that day - out... and back! We motored back up into Solomons but this time decided to try an anchorage up one of the other creeks in the area. Here, we had a very humbling anchoring experience. The mud in the creek beds around the lower Chesapeake is very, very soft. It's like dust! It's so fine, that your anchor comes up clean - but dark colored. The chain looks almost anodized after it sits in this stuff. Anyway, we set the hook deep in a cove that had some houses around it where the wind was very light. We started getting some food out and Linda noticed that we had dragged almost 100 yards! Whoops! - ok we hauled the anchor, motored back up and dropped it again. This time, we really did a good tug to set it and I put even more scope out. Back to lunch and.... we're dragging again! Amazing - we have never dragged before and this wind was so light in the protected cove. We decided to head back to the anchorage by Zanhisers. We anchored there without any problem and were able to take off early the next morning for another attempt at heading down the bay. The next day, we set off early and conditions were beautiful. This was one of those sailing days that non-sailors probably imagine every day on a sailboat is like. Great wind behind the beam, flat water and warm, clear skies. The only downside is that I had to work some while underway. Along this leg, we were in the company of many other boats taking advantage of the good weather and heading south. 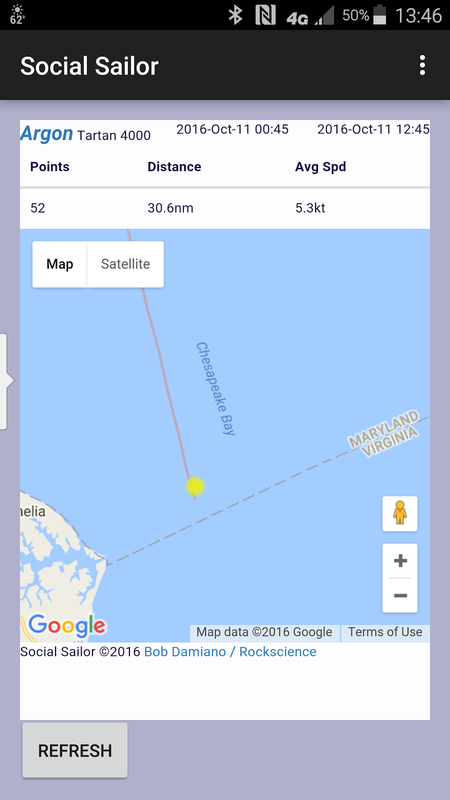 There was an AIS target up ahead called "Ancestrial Salute" that was always just 0.1kt faster or slower than us. Eventually, the wind softened up and we got a little advantage over her and overtook her (briefly). 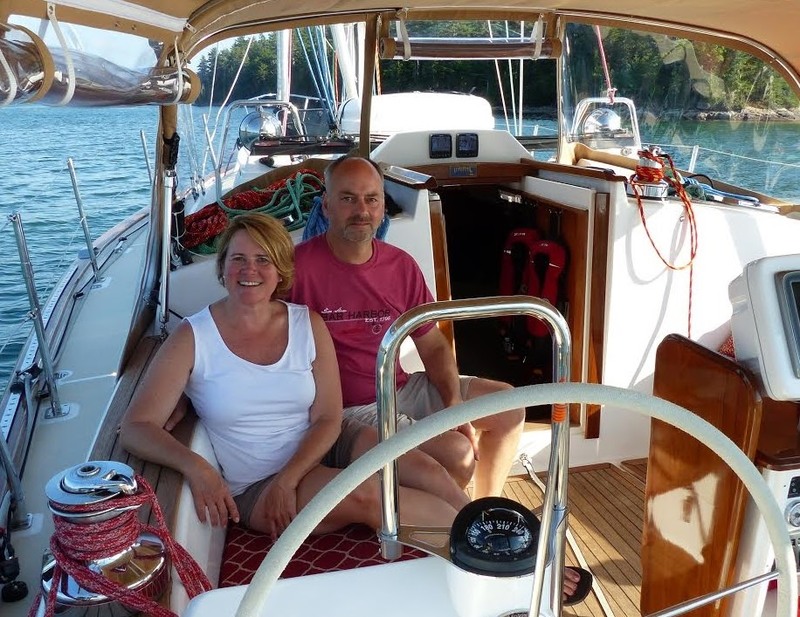 We snapped some photos of this lovely 56' ketch and next thing we knew, her skipper Stephen was hailing us. "Hey Argon - I've got some great pictures of you". So we emailed our photos back and forth. 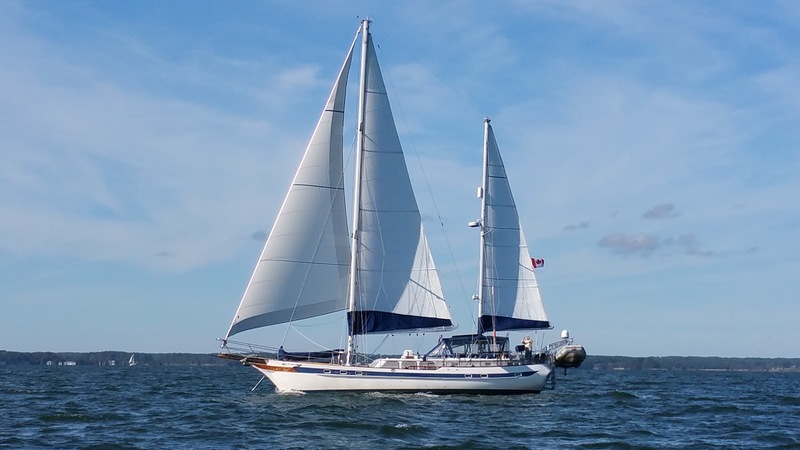 Playing tag with this beautiful Ketch from Canada "Ancestrial Salute". 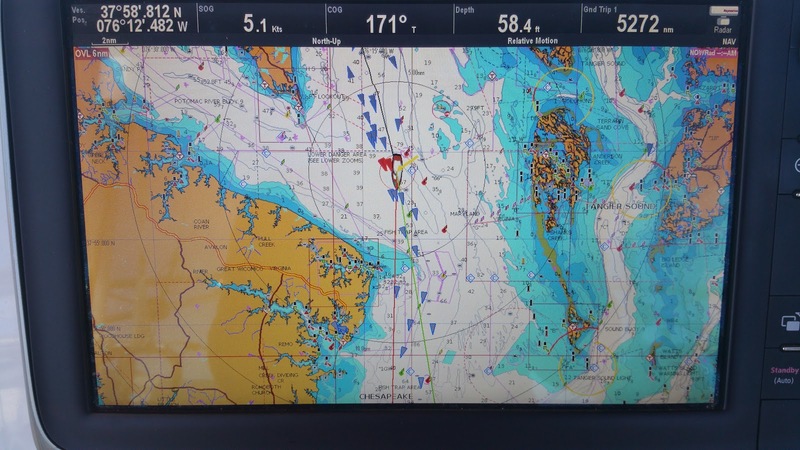 South of Solomons, there are lots of places to tuck in and anchor, but not a lot near any sort of civilization. I was craving data connectivity a bit and our ships stores were craving a trip to a grocery store pretty soon. We decided to just head all the way to Hampton, Virginia and anchor in the Back River near Langley AFB. Linda started spreading rumors of a BBQ place near this anchorage. I was all over the idea of finding this. We did - and what a gem! 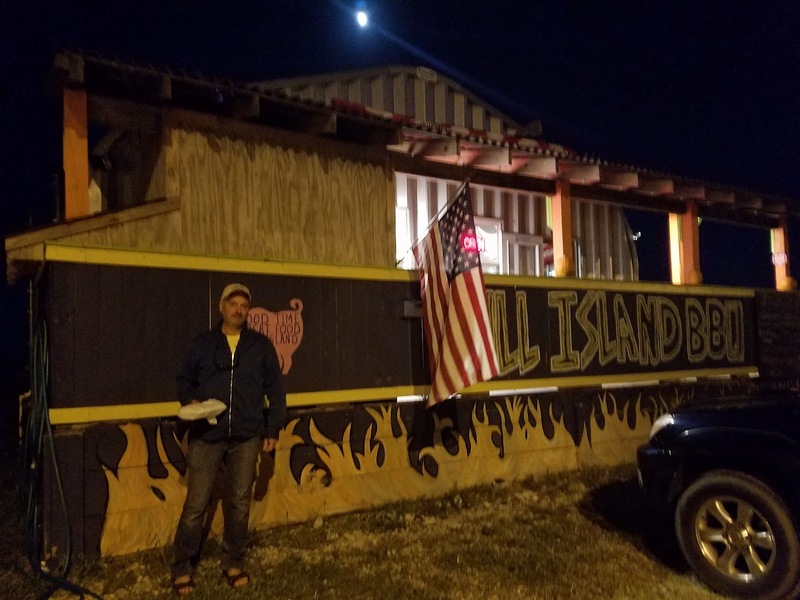 The Bull Island BBQ is this funky little place in a corrugated steel building run by a very enthusiastic woman who cooks everything right there. You sit at a bar surrounding the kitchen which is full of crock pots loaded with her delicious offerings. We're sort of kind of vegetarian but we definitely were not that night. After a very lovely quiet evening at anchor, we motored through some very heavy fog into Hampton Harbor. We had a slip reserved at Blue Water Marina. Ah - electricity, free wifi, a real shower, endless water, washing machines, nice docks! Life is good. The rates here are an amazing $2.00/foot/night. We met some people from Virginia Beach who were complaining about the high rates. I told her what she would be paying in Boston and she was shocked. Settled into Bluewater Marina. We're on "D" Dock - just like home in Boston. Hello to our D Dock friends at Constitution Marina, Boston! One of the coolest things about this experience so far has been the number of people we have met who are doing something similar to what we are doing. There are so many great stories to hear and share and we all benefit from them. Everyone has different ways of solving just about everything from how to rig a sailboat to how to break from a career to actually do this. So, here we are in Hampton, Virgina. We're going to sit tight until we make the big off shore jump to Bermuda in a week or so. Ken McKinley from Locus Weather will begin to look for weather windows next week. 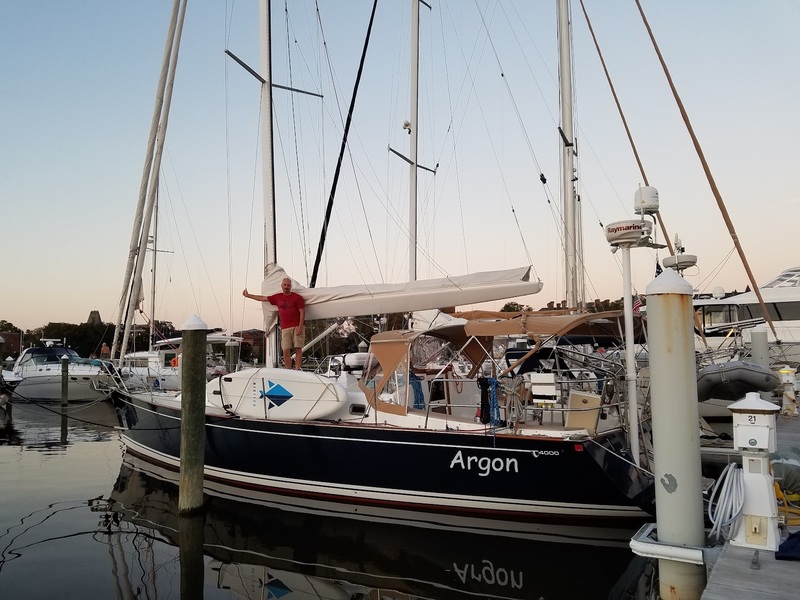 We have our good friend and extremely skilled sailor, Lance, flying down from Boston to crew with us for the Bermuda Leg. Linda intends to write much more about preparing for that adventure. A short dinghy ride up the river gets us to the main town. 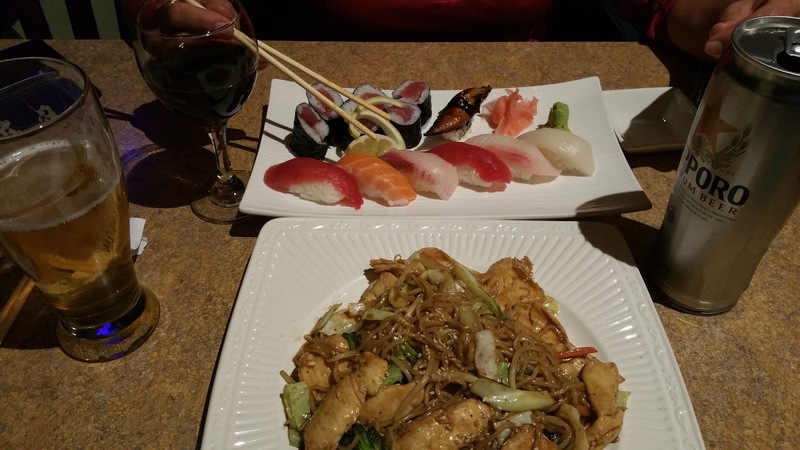 There is a lovely short restaurant strip on Queen's Way and so far, we have not found a bad choice. 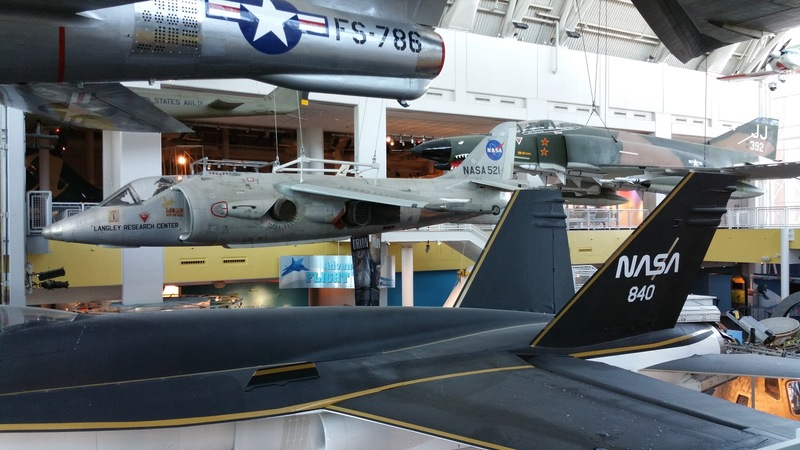 Besides restaurants, there is also a pretty nice Air and Space museum. 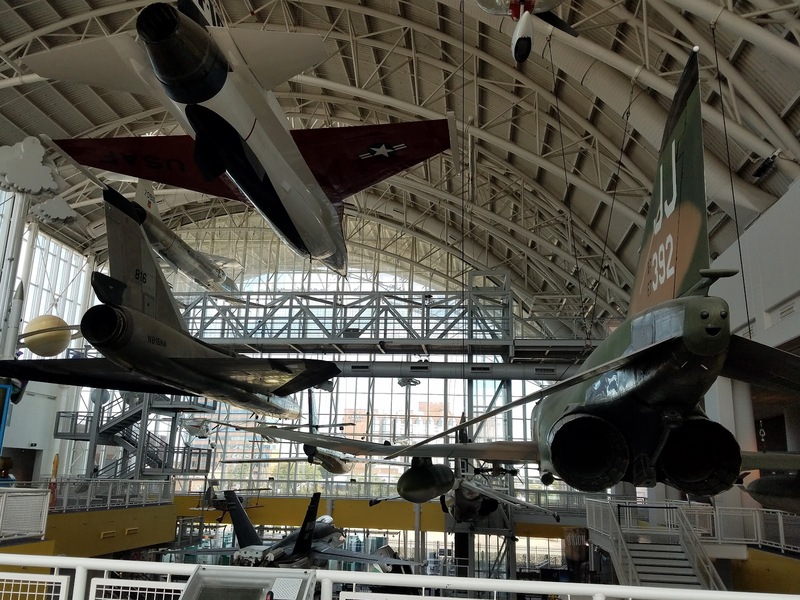 We played tourist for a day and went all through that. Pretty nice! The public town docks are also here and we will be moving to them for the remainder of our time here. The public docks have a great deal for us cruisers. If you give them $75, you get a $0.75/foot/night rate for a year. Not only that, but every four nights gets you a fifth night free. It's a great place for people like us to wait for crew and weather - and it's in an awesome location! Getting ready for Bermuda... We AReGONe!! Great sail handling video. I agree about having to have the boat directly into the wind to raise the main with the lazy jacks in place. 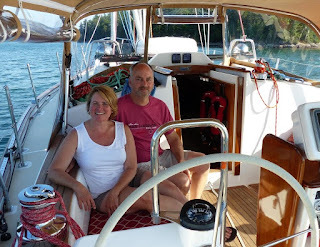 On VenChar, we have the same electric winch, with Harken Battcar system and we modified our lazy jacks so once the sail is comfortably dropped onto the boom, we drop the lazy jacks and attach them forward on the mast. A very easy modification but you'll need to lengthen your existing lazy jacks. Hence the lazy jacks are never in the way of the battens as the main is raised. I may have a picture, if you'd like to see it. Great idea Larry. The wheels are turning. Our adjuster line is already pretty extra long so I think we could probably pull them forward enough to get them out of the way (or reduce how in-the-way they are).